If you are reading this in hopes of learning some news of what happened during the 2013 comics festival in Angouleme you may want to go elsewhere. No news here. Just stuff. 1. 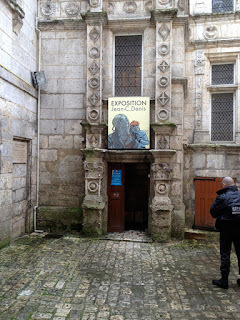 For the third year in a row, I arrived in Angouleme a week prior to the festival to teach a Masters Class in Comics Narrative at the EESI school. 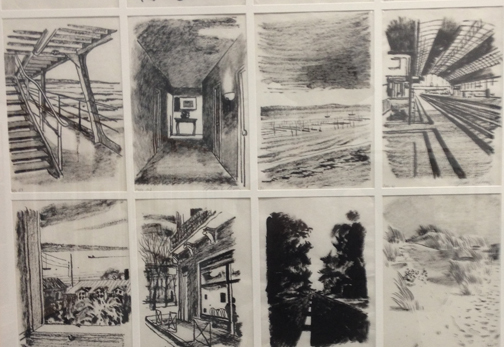 In four classes my students produced eight-page mini-comics (plus covers). Here you can see them assembling their comics that they then sold as collected packets at the festival. 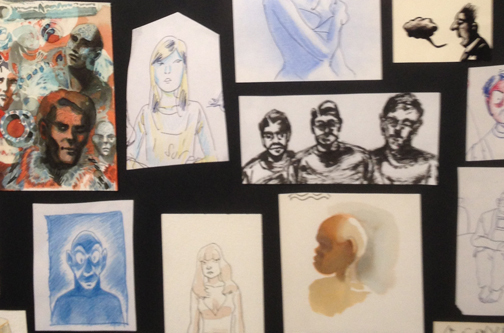 We used the proceeds to fund cartoonists in need…of a glass of wine. 2. 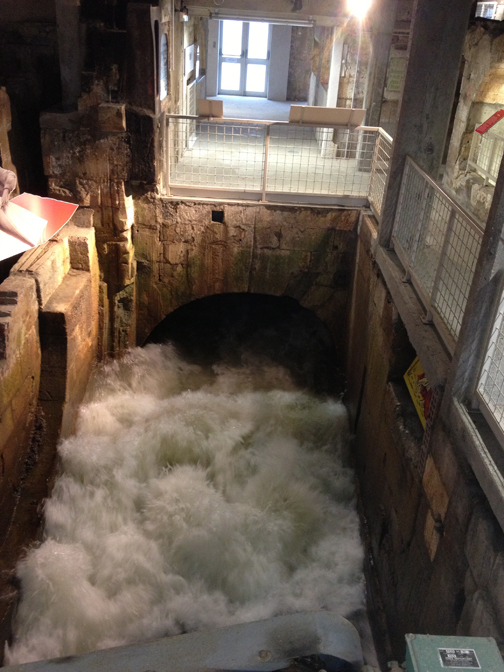 The EESI art school is housed on the top floors of an old paper mill, directly above the rushing waters of the river which course through channels built in the bottom floor. During class, the constant whooshing can be heard below. 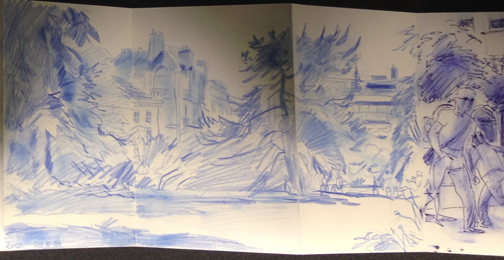 Yet never once did I go into the paper museum housed there until this year. 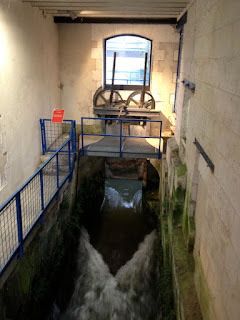 It is one of the highlights of the town. Enormous pieces of papermaking equipment handsomely displayed to the soundtrack of the whoosh. Here are some paper objects that (I think) were printed in this plant when it was actually making paper. And if they were NOT printed here, they could have been. 3. Each year the festival chooses a President for next year’s festival. The President gets the honor of being badgered and interviewed a lot and signing the Mayor’s sketchbook and having a retrospective of his work installed. These exhibits are generally lavish affairs, but this year’s President, Jean Denis, had a modest showing. So modest that I doubt that I could lead you back to the location of the exhibit even with (ESPECIALLY with) the festival map. I just turned around at one point and there it was. I think that this may be the entrance to the Jean Denis exposition. There were other exhibits this year that got a lot of justified press 'cause they were landmark (the Asterix exhibit), or cooler (the stylish Finnish installation had me laughing out loud). But Denis' show was generally overlooked. Too bad. I cannot speak with any authority about Denis’ stature in the field as I have read very little of his work since it is almost exclusively in French. His original comics pages are extremely attractive and competent and speak to a specific era of 70s/80s French comics of disaffected youth. I imagine that for those who grew up reading Denis, this stroll down memory lane must have been balmy. But, honestly, the comics work on the first floor of the show did not send me. I almost did not climb the circular stone staircase to the second floor of this show...but I am glad that I did. 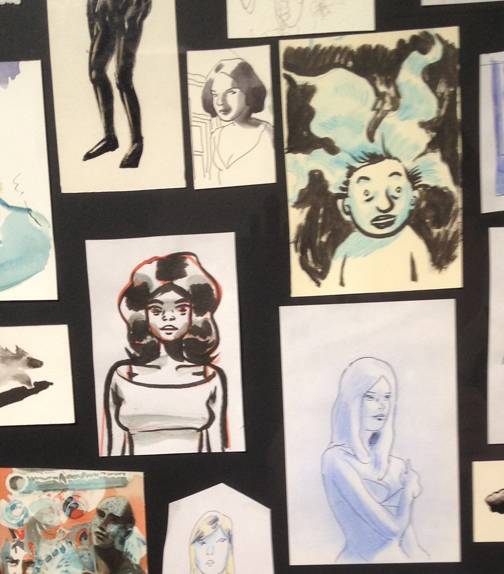 I include here a bunch of swell sketches and sketchbook pages that filled the second floor walls. 4. 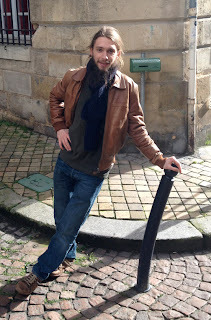 I took a day trip to Bordeaux to visit cartoonist, Vincente Perriot, a very nice man who has a nice girlfriend (who cooks very nicely) and who gave me a nice tour of his nice town (Bordeaux not Nice, a town I have yet to visit). 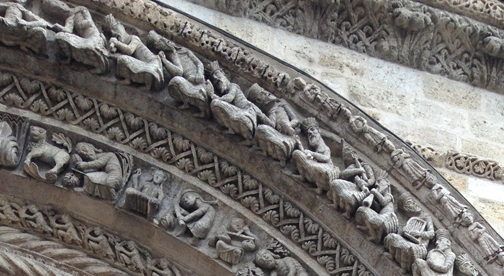 Here are some details from the façade of St. Pierre. Exactly WHAT has been going on here for the past 1000 years? 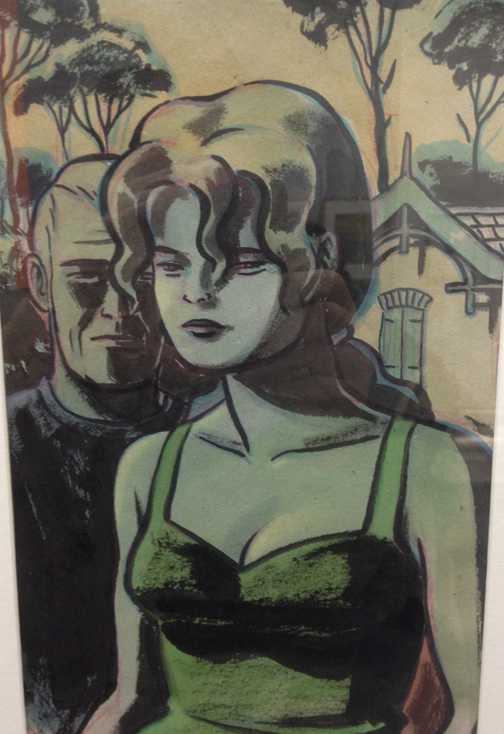 We came upon a fine store in the heart of Bordeaux filled with old comics and books and paintings and junk. 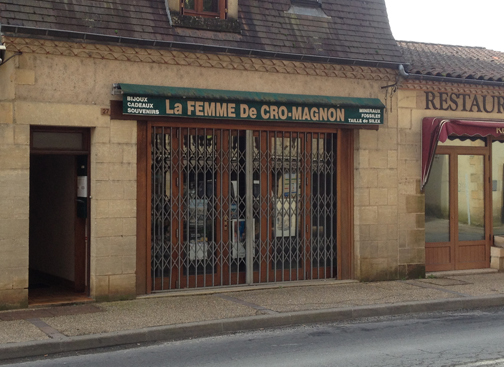 For me, a good junk store is hard to find in France. 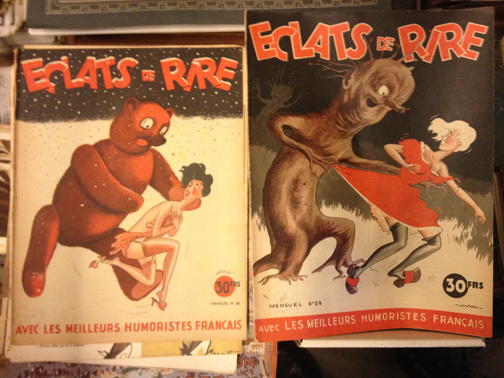 Here are two covers from some rag called Eclats de Rire. Evidently issue #26 sold so well that they came up with a clever variation for issue #29. Gaze and ponder the many mysteries. 5. 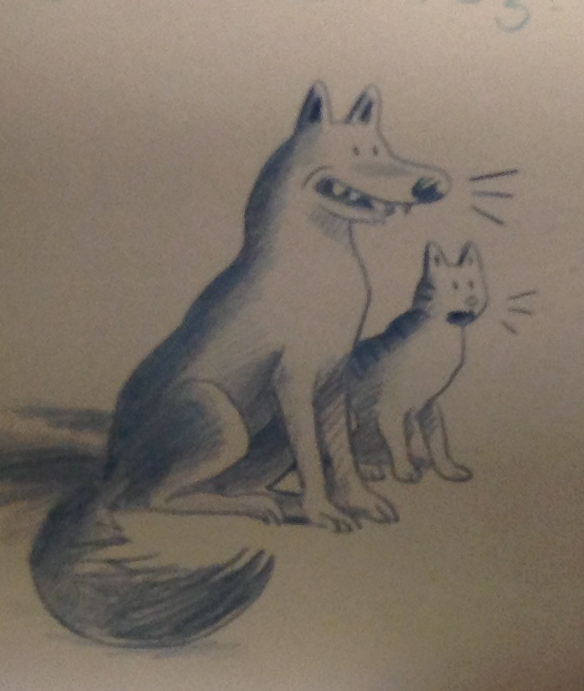 Cartoonist, Sarah Glidden (“How to Understand Israel in 10 Days”), has been working on her new book in Angouleme for the past year and cartoonist, Ted Stearn (“Fuzz & Pluck”), has been working on a new book in Angouleme for four months. 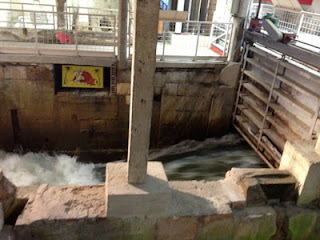 Along with Ted’s cousin, Lolly, we borrowed a car and drove to the Dordogne to go to a cave. and the Venus of Willendorf paperweights. 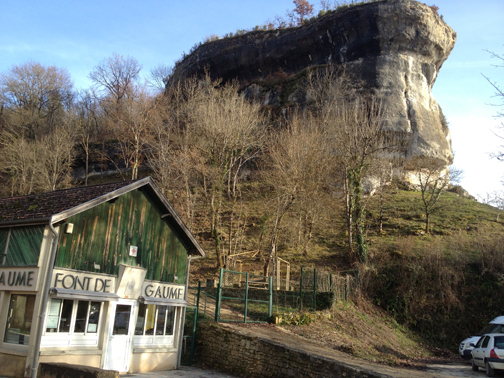 Now that Lascaux is closed (unless you count the plastic faux Lascaux replica that they have erected as tourist fodder), some of the best cave drawings that one could see in the 21st century are at Font de Gaume and January is a great time to go see them. At peak season you must get in line early in the day to be allowed in. 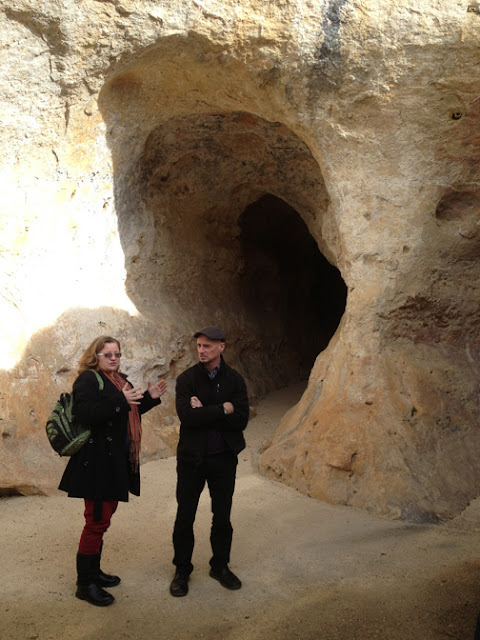 Along with about eight others we waltzed in at 1:00 when the office opened and immediately went in the cave. Lovely Futura lettering jigsawed out of wood. The caves are in that bluff on the top of the photo. Ted and Lolly in front of the cave. The walls are fragile, so our superb tour guide asked us to stop waltzing and in the dimly lit caves he patiently brought the work into focus. It was a revelation. These drawings may have been done 20,000 years ago but there is nothing primitive about them. They are well-observed, anatomically correct, proportionally correct, and indicate an understanding of overlapping to suggest depth. Most importantly they are full of vigor and intelligently integrate the textures and topography of the cave into the designs. Plus, how utterly cool is it to look at ancient drawings in their own home? 6. A short drive from the caves and a ten-minute stroll through the woods there is a ruined castle, Chateau de Commarque. Closed to clamborers in January, the castle (or what is left of it) can be enjoyed from the field below by tourists, photographers, and serfs alike. that face the chateau ruins. This is a blues original written by the multi-talented cartoonist and crooner, Joost Swarte (along with his pals), and stuck in the middle of his lecture on February 2, 2013 in Angouleme. Did I say multi-talented? Mr. Swarte has designed stained glass installations, movie houses, and the Herge Museum (which, in Angouleme, is like designing God's patio). Now he has designed eye-wear (what we used to call glasses). It is hard to see in this photo but inlayed into the corner of the frames are a set of quotation marks, thus giving the viewer, according to Mr. Swarte, an ironic world view.